Back in October 2016, the NDC Partnership welcomed Uganda as one of its first members, a member that strongly believes in the aspirations of the Partnership and its aim to enhance international cooperation to support the implementation of Nationally Determined Contributions (NDCs) under the Paris Agreement. Climate change is a global challenge, a challenge that goes beyond the geographical divisions we create, it binds us together towards the common objective of global welfare. International cooperation and respecting each countries’ common but differentiated responsibility to the articles of the Paris Agreement will determine much of our success. This is where the NDC Partnership stands in support, by facilitating the transfer of financial and technical resources in Uganda and across the world. Within Uganda’s NDC, the country strives for a 22 percent reduction in greenhouse gas emissions by 2030 relative to a business-as-usual scenario. Mitigation aspirations are clear, although adaptation has been stated as a definite priority for the nation. The reduction of urban and rural vulnerabilities, and increased climate resilience – especially in the areas of agriculture and livestock; forestry; infrastructure; water; energy; and health – have been set as key milestones to a sustainable and prosperous nation, as depicted in ‘Uganda Vision 2040’. 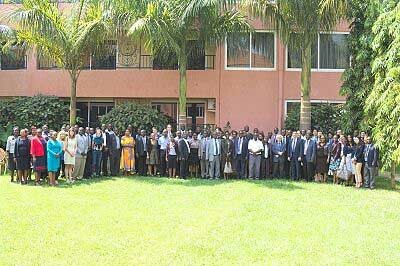 Within Uganda’s first official communication to the NDC Partnership, the Climate Change Department (CCD) of the Ministry of Water and Environment emphasized that “the challenge now turns to implementation”, and here the NDC Partnership stood ready to support Uganda to enhance, and realize, the nation’s ambitious climate change agenda. The NDC Partnership Support Unit conducted a mission to Uganda in August 2017 to follow up on the results and discussions which had taken place during the “Strategic Dialogue on Achieving Uganda’s Climate Goals” a few months before, in June 2017. The Support Unit consulted with Uganda’s NDC Partnership Focal Points, namely, the Ministry of Water and Environment (MWE); Ministry of Finance, Planning, and Economic Development (MoFPED); and National Planning Authority (NPA) to kick-start the development of a concrete proposal for support, based on the findings of the Strategic Dialogue. The official proposal – which identified 11 different support requests and the requirement for two technical advisers to support the NPA and CCD – was received on the 5th of September 2017. By December 2017, the NDC Partnership had consolidated and shared immediate responses which identified support from six implementing partners: the German Agency for International Cooperation (GIZ), the Global Green Growth Institute, NAP Global Network, the UN Development Programme (UNDP), World Bank, and World Resources Institute. This response helped pave the way for the design and implementation of the first NDC Partnership Plan in Africa, the mention of which received great applause in the opening statements of the Partnership Plan workshop that ensued over two days on the 30th of January and 1st of February 2018.